A chicken is supposed to eat one-quarter pound of feed per day. I’m not sure whose chicken that would be, or what would be its breed, age, size, and position in life, but we’ll take it as a general rule that a laying hen eats something in the neighborhood of 4 oz. of something every day. Ours do. Generously, that means we need a few pounds short of 100 lb. of feed per bird per year — not a small amount. Our own birds eat fermented or sprouted wheat, in addition to grass, bugs, and a bit of meat or milk for protein. The grass, bugs, meat and milk are all free products of our land, things we have in abundance and need to feed to something. The wheat we buy, at $5/bu. (roughly 60 lb.). That’s just over $.08/lb., so we may spend as much as $8/bird/year on feed. Now, our birds lay at a rate of something like 50%, averaged over the year, or about 180 eggs/bird/year. 180 eggs is 15 dozen eggs — from a bird we pay about $8/year to feed. That’s 15dozen pastured, cage-free, soy-free, corn-free, GMO-free eggs for just over $.50 per dozen. The cost of buying the chick and raising it to laying age — about $7 — can be discounted, because when the hen gets too old to lay we’re going to make chicken pie, and feed the bones to the hogs. Glory be to God for chickens and privileges. Standard laying mash is around 16 – 18% protein; that’s what they make for commercial producers and backyard chicken keepers aiming at a very high rate of lay. This is at least in part because modern hens have been selected for maximum performance in the short run, not longevity or duration of lay. It takes a lot of dietary protein to make an egg. Today, the commercial goal is to get at least 300 – 330 eggs per hen in her first year of lay, then sell her to Campbells; in the typical backyard flock, same genetics, you might keep her around for a second year if you don’t mind much reduced performance. After that, the soup pot. In contrast, eighty years ago a hen was considered a good layer if she gave 200 eggs per year, and she was expected to lay for several years. If what you want is an accelerated rate of lay, you’ll need to supply a lot of protein. But if you’re going to pasture or free-range — which is what it sounds like you intend to do — then you’re probably electing to go for a more natural rate of lay, which leaves more latitude in the matter of how much protein supplement you provide. Now, if you were really setting out to determine precisely how much protein you needed to reach 18% of the birds’ diet, you’d have your work cut out for you. First, you won’t know what the birds are picking up as they forage, so you can’t know its food value. Secondly, the percent protein of those bulk foods (like corn, wheat, oats) with which you make up the majority of their ration can vary a great deal from batch to batch, depending on a lot of variables, so you’d actually have to test each batch of grain you purchased or grew to determine its composition. Only if you know all of the variables can you calculate with accuracy the amount of milk or other protein you need to raise your total ration to the 16 – 18% rate. Fortunately, it’s not really that hard to get a satisfactory ration without all of the numbers. You say you would like to switch to ‘grass and natural feed’ for your flock. Let’s assume that means you’re going to free-range or pasture the birds, while providing some kind of grain ration. Corn and most of the cereal grains average well below the minimum recommended percentage protein, but they’re good for some protein and for plenty of carbs. With dry grain rations, it’s generally considered that a hen of average size needs about one-quarter pound of feed per day, and somewhere around that’s not a bad place to start. 18% of 4 oz. is 0.72 oz. protein, and they’ll get more than half of that from their grain and whatever they pick up foraging, so if you offer a high-protein supplement like curds or waste meat, which are about 25% protein, an ounce of one of these per day gets your birds’ ration up in the high-protein range. For visual reference, that’s a lump about the size of a hulled walnut, or rather smaller, per bird. All that said, in the summer a free-range bird with plenty of pasture (not bare soil) to range about in is going to pick up a lot of bugs and worms, and might do very well without protein added to her grain allotment. And since she’s free-range, she may also hide all her lovely eggs where you can’t find them. The practice of farming has more in common with dancing than with science: if you want it to be beautiful and enjoyable, you pay attention to your partner and respond to changes in the rhythm. Our average temperature over the last few weeks has been about ten degrees – that’s Fahrenheit, for our friends in Canada – and the impact of such low temperatures reaches into every aspect of our days and nights. Life becomes a response to the weather, maybe like being on a tall ship in a big storm, where there is some overall plan but also constant adjustment to event. This morning at five the thermometer said it was 31 degrees, and we are relaxing into the lull. 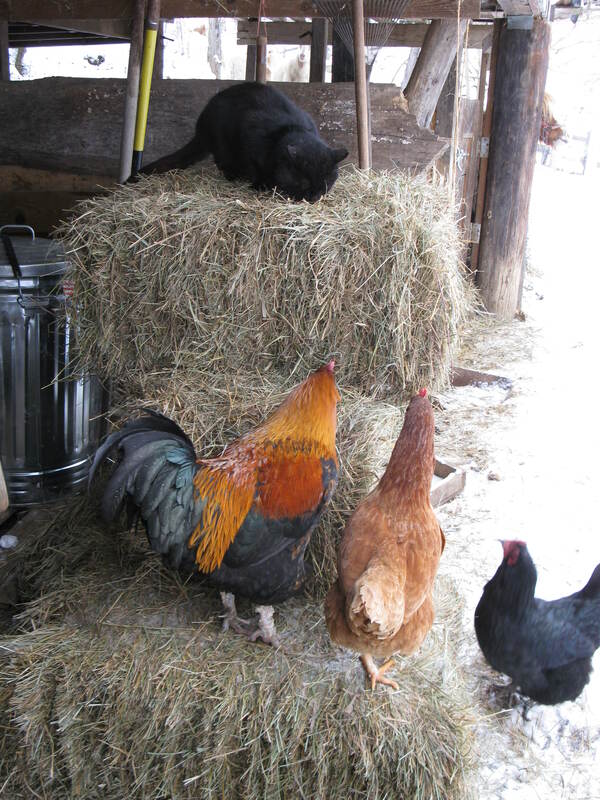 The chickens, after dropping way down for the cold spell, are picking up again – today thirty-four hens gave us seven eggs, about twenty percent lay. Poultry serve multiple purposes on our farm, moving over pastures and gardens in (at the moment) four different flocks of from ten to thirty layers and a couple of roosters. 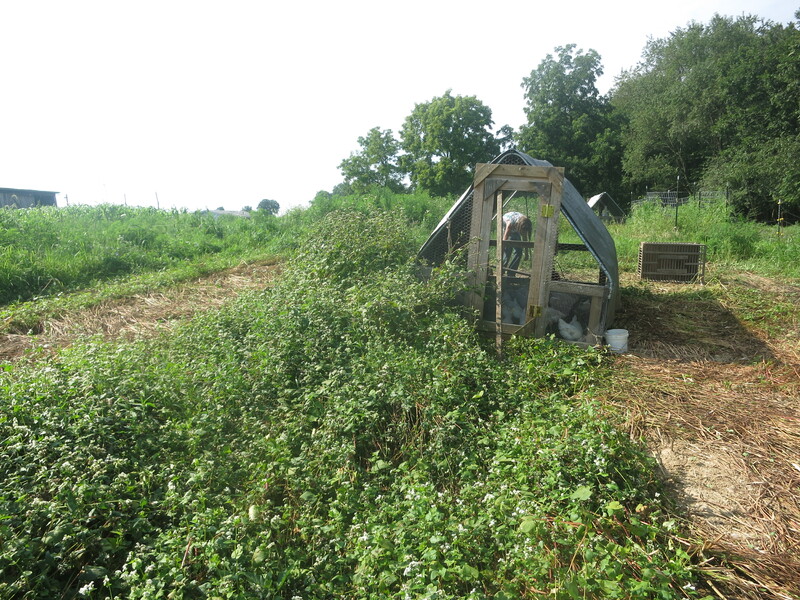 Some of the birds clean up after the grazing animals, but about half of them are pastured in garden areas where we want to apply some high-nitrogen fertilizer, clean up insect pests, scrap out weed seedlings, or flatten a grown-in-place mulch. In the fall, though, when laying slows down, we cull non-layers so we don’t carry so many birds through the winter. This isn’t done on the basis of age, at least not solely — some twenty of our birds are in their fifth year and still productive — but according to a physical examination that considers the space between their pelvic bones, the space between the pelvic bones and the keel bone, the color of their feet and legs, and the condition of their vent. Two fingers or more space between the pelvic bones, four between pelvis and keel, bleached legs (not yellow), and a moist, open vent are what we are looking for, and three out of four of these will usually win that hen a reprieve from the hatchet. Last week we went over all the birds; seventeen didn’t make the cut. A very busy morning for three of us, and (for one) an afternoon with a couple of canners. Only two birds had eggs in them, which we would consider a good score; the older birds we kept seem to be laying at about sixty percent, not bad for November. We’ve had a lower rate of lay, but much better luck with longevity in our layers since we switched from commercial laying mash to fermented whole grains with no GM or soy; and our mix of whole grains, supplemented three or four times a week with milk or meat scraps, is much cheaper per pound than commercial feed. do genetically modified feeds make chickens infertile? Our informal survey of laying-flock owners, carried out over the past year, to date presents results of unqualified unanimity: not one of the farmers we’ve spoken to has seen an even remotely reasonable second lay. That means that their young hens, after a first few months of laying and a moult, do not go on to a second year of egg-laying. In other words, they become sterile. 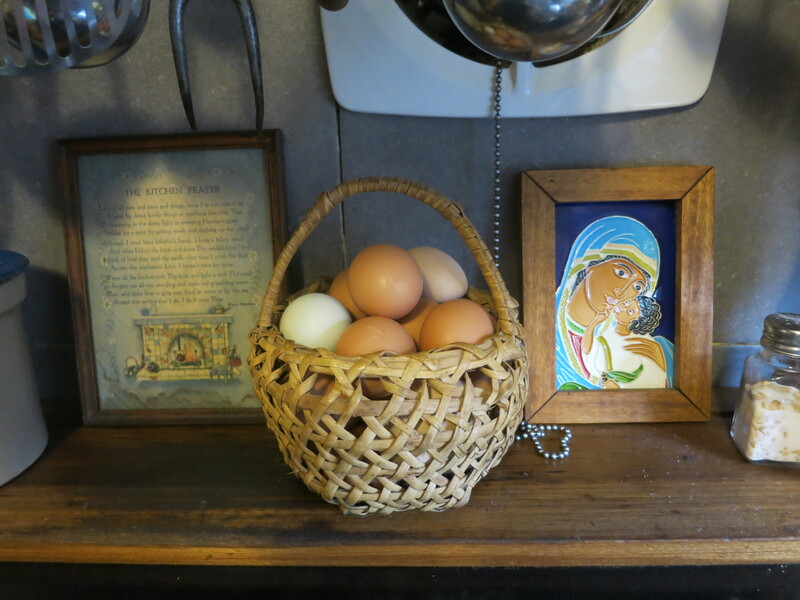 When the girls and I butchered forty one- and two-year-old hens in September, not one of them had a fully formed egg in her, and only two had partially formed eggs. Until the past couple of years, we would have seen eggs in at least fifty percent of them. Go look up the article in the Huffington Post on GMO’s and infertility, and then check the ingredients list on your poultry feed. And if you want to know why, then, the egg-factory farmers aren’t complaining, perhaps it’s because in their operations, a hen never gets a chance at a second lay — she’s shipped to the soup cannery. Time for new chicks and home-grown feeds.